The president meets with video game industry executives on Thursday. President Donald Trump is set to meet with representatives from the video game industry at the White House Thursday after the president pointed to violent games as a contributing factor to school violence in the wake of the Parkland, Fla. high school shooting. Since the shooting, the president has repeatedly suggested that reforms may be in order for the gaming industry as part of a broader package of preventative policy steps to prevent gun and school violence. “I'm hearing more and more people say the level of violence on video games is really shaping young people's thoughts,” the president said during a meeting with state and local officials on school safety a little more than a week after the Parkland shooting. 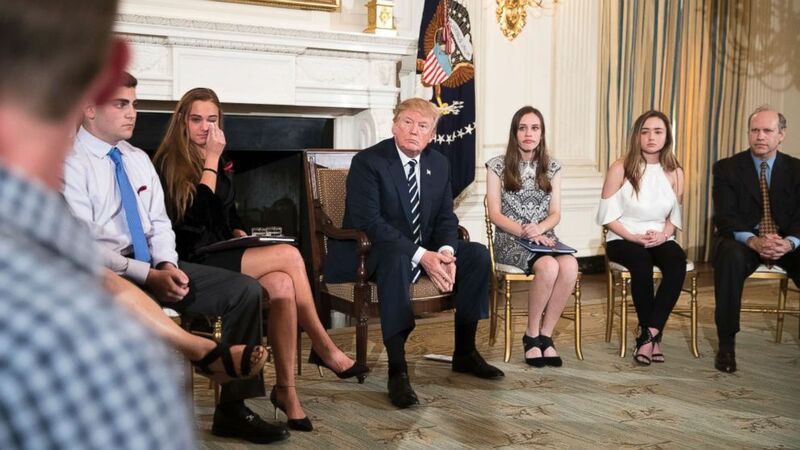 (Tom Brenner/The New York Times via Redux) Marjory Stoneman Douglas High School shooting survivor Samuel Zeif, left, speaks to President Trump during a listening session with high school students and teachers, at the White House in Washington, Feb. 21, 2018. The president again pondered the role violent video games play in shaping young minds during a freewheeling meeting with lawmakers last week on how to strengthen school safety. When Tennessee Republican Rep. Marsha Blackburn told the president she hears from concerned parents about the ratings system for video games and movies, the president agreed and said it’s a concern he shares as a parent. “It's hard to believe that, at least for a percentage — and maybe it's a small percentage of children — this doesn’t have a negative impact on their thought process. But these things are really violent,” he continued. The president has inserted himself in an age-old debate over whether video games contribute to violent tendencies in young people, with a range of studies on the topic over more than two decades of research reaching varying conclusions about whether a reliable correlation exists. The American Psychological Association stated in a 2015 policy statement that "the link between violent video game exposure and aggressive behavior is one of the most studied and best established" but also noted that "insufficient research has examined whether violent video game use causes lethal violence." 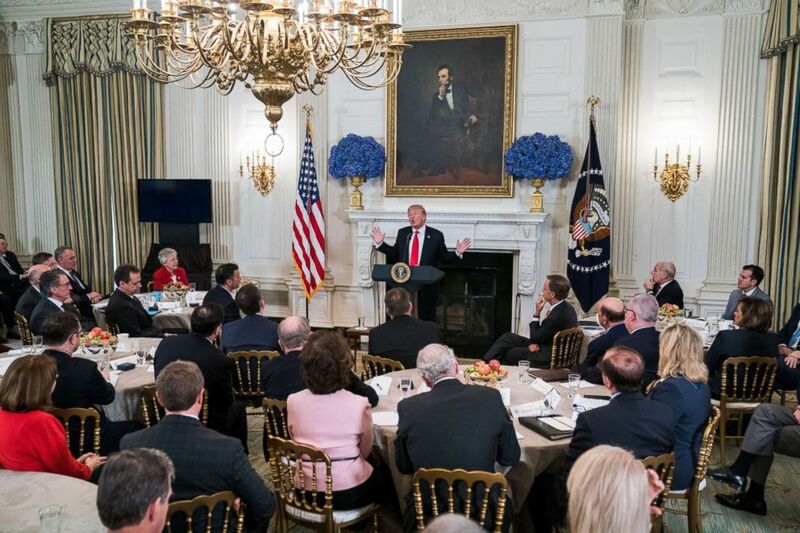 (Jim Lo Scalzo/EPA via Shutterstock) President Donald Trump speaks about ways to combat mass shootings at high schools during a meeting with the nation's governors at the White House on Feb. 26, 2018. White House Press Secretary Sarah Sanders would not elaborate on what the president hoped to accomplish with Thursday's meeting with video game leaders, except to say that it is intended to be part of ongoing discussions the president is having as he explores specific policy solutions. “The President wants to continue the conversation on every different area that we can to help promote school safety. And I’m not going to get ahead of the discussion that they're going to have tomorrow, but we think it's an important discussion to have and one that the President looks forward to,” Sanders said. A White House spokesperson said the meeting will be the "first of many" with industry leaders on the topic. “As we continue to work towards creating school safety programs that protect all children, the President will be meeting with video game industry leaders and Members of Congress to discuss violent video-game exposure and the correlation to aggression and desensitization in children," Deputy Press Secretary Lindsay Walters. Among participants expected at Thursday's meeting will be the president of the biggest video game trade group, Pat Vance of Entertainment Software Rating Board, but also outspoken critics on violence in video games, such as Melissa Henson of the Parents Television Council. Several members of Congress, including Sens. Marco Rubio, R-Florida, Rep Vicky Hartzler, R-Missouri, and Rep Martha Roby, R-Alabama, will also be at the meeting.